Contact lenses are popular with people who don’t want to wear eyeglasses. Contacts are not only aesthetically inconspicuous, but they also offer more natural vision because they move with your eye and nothing gets in the way of your line of sight. Contact lenses are great for people who lead active lifestyles, and they don’t fog up the way eyeglasses can. Just about anyone can wear them, and they’re available in a wide range of prescriptions. Do you think you might want to give them a try? Here are some important things you should know about contact lenses. Your eye doctor can help you decide if contact lenses are right for you. Some people can’t wear contacts at all, perhaps because of conditions like dry eye or certain allergies, or maybe because their vision needs a higher degree of correction than contacts can offer. If your doctor decides you are a good candidate for contacts, he or she will work with you to find a pair that comfortably fits the size and shape of your eyes, enables you to see clearly, and matches your lifestyle. There are three major groups of contact lenses. Soft contacts are very popular because they’re more comfortable than some other lenses. They’re made of soft, flexible plastics designed to allow oxygen to pass through the cornea. 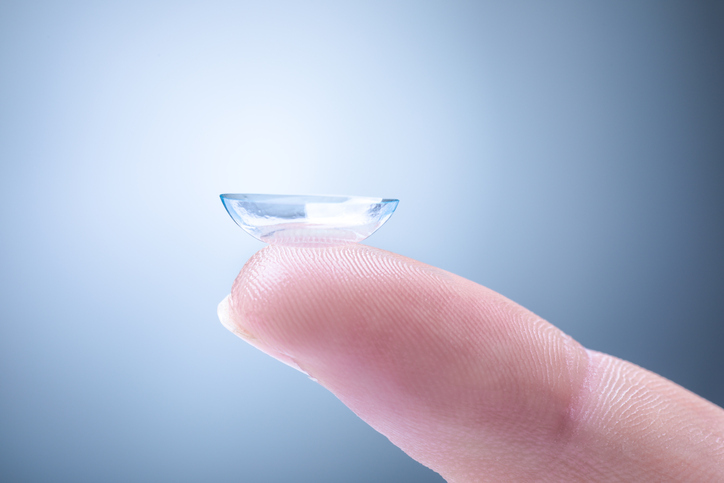 Soft contact lenses can correct nearsightedness, farsightedness, astigmatism, presbyopia, and some corneal irregularities, and they come in daily wear, extended wear, and disposable versions. Hard contact lenses, also known as rigid gas permeable lenses, work well for most vision problems. They’re typically more breathable than soft contact lenses, and this can reduce the risk of eye infections. While some of them must be cleaned nightly, some hard lenses are designed to be worn for lengthier periods of time. When properly cared for, a pair of hard contact lenses can last for up to three years. Specialized contact lenses are made to meet specific needs. Hybrid lenses have a hard gas-permeable center and a soft outer ring. They’re good for people who have trouble with traditional hard contact lenses and can correct nearsightedness, farsightedness, astigmatism, age-related loss of close vision, and keratoconus. Bifocal and multifocal lenses are available in both hard and soft versions, and tinted lenses can be used for aesthetic purposes or to enhance contrast and color perception. You can choose between daily wear, extended wear, or disposable lenses. Daily wear lenses are the most economical option and must be removed each night to be cleaned. Extended wear soft contact lenses must be cleaned and disinfected at least once weekly. They can be worn overnight, but wearing them while you sleep can increase the risk of eye infections. Disposable lenses tend to be expensive, and don’t need to be cleaned; they’re thrown away at the end of their recommended time frame. It’s important to follow your doctor’s instructions on cleaning your contact lenses. Whichever contact lenses you choose, make sure you’re cleaning them properly. Never touch them with hands that aren’t freshly washed, don’t let them come into contact with water or saliva, use contact lens solutions specifically designed for your type of contact lenses, and throw out contact solution that’s past its expiration date. Contacts need to be replaced frequently to reduce the risk of eye infections. It’s important to follow manufacturer instructions when it comes to replacing your lenses. It’s also smart to replace your contact lens case every three to six months. When you wear contact lenses or eyeglasses, it’s important to see your eye doctor regularly. Your doctor can make sure your prescription is still on point, educate you about caring for your contacts, and help you manage any issues you may be having. If you’re looking for an ophthalmologist or optometrist in Derry, Londonderry or Windham, Spindel Eye Associates is here for you. Celebrating over thirty years in eye care, we proudly provide our patients with personalized eye care, using top of the line technology. For more information or to schedule an appointment call 603.421.6536 or contact us through our website.